modern houses / apartments with large-scale kitchen, often combined with a dining room. Due to the sufficient working area, the kitchen table here is used exclusively as a dining table. In this situation, the fundamental point when choosing furniture for the kitchen is its size. The functional characteristics of the kitchen, as well as the table, their performance data fade into the background compared with the dimensions. 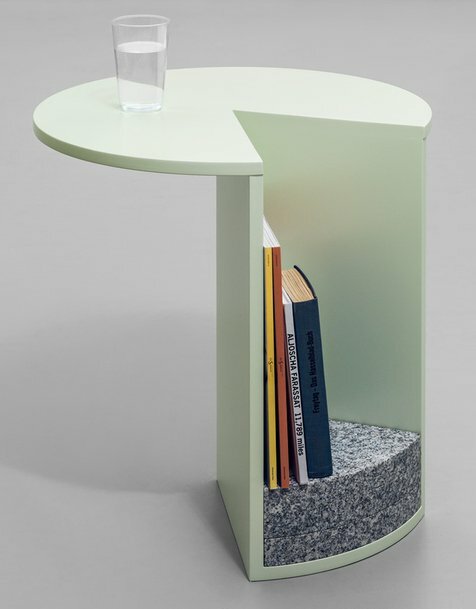 Therefore, more recently, the requirements for the material of manufacture of the table and its design were minimal. But recently, kitchen tables, cabinets and transforming tables, which are ideally suited for small rooms, have appeared on the market. Regardless of the structural solution, they have an additional tabletop. These can be either folding models or those in which the “spare” tabletop rolls out or rises. Here it is important both its construction and the quality of the material from which it is made. The problem in this case is one – its weighty value (in comparison with the price of the budget kitchen table, it is palpable). 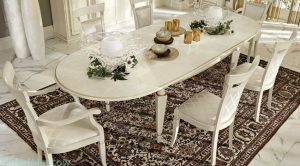 Regarding the classic kitchen table located in a small kitchen, the requirements for its characteristics are dictated by the versatility of its use: it serves as a work surface for cooking, and directly as a dining table. Therefore, the main requirement (except for suitable dimensions) is its strength and tabletop resistance to mechanical stress, thermal and chemical effects. It is highly desirable to have no sharp corners, as in a small room it is easy to get hurt. What material is better for the countertop dining table? Plastic. The table top is inert to food and moisture, but is exposed to abrasive cleaners and high temperature. Wood. Solid woods are sufficiently resistant to mechanical and thermal effects. However, over time, the wood cracks, and dirt accumulates in its crevices. Metal. The most resistant tabletop with virtually unlimited service life. 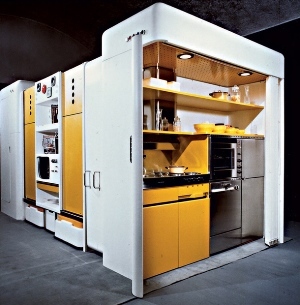 Organically perceived only in the kitchen, decorated in the style of hi-tech. The disadvantage is the high cost. Glass. Visually, a very good option for a small room. However, the operational glass table has many limitations, a little acceptable for the kitchen table; Point blows and temperature drops are not allowed. Laminated chipboard. It has high technical and operational characteristics, is quite affordable and varied in color and texture. These characteristics are universal and do not affect the choice of the table in terms of the scale of the kitchen. Since there are no restrictions regarding the dimensions of the table in this case, the main criterion is the quality of its manufacture and compliance with the overall design concept. An important point is also the maximum number of people who will be comfortable sitting behind him. The most reasonable choice is based on the number of family members + 2-3 people. It must be remembered that the comfort zone at the dinner table of one person is about 70 cm. The central attribute of the dining area is the table. In this context, it can serve as a bright accent around which the whole design concept will be built. Therefore, the aesthetic characteristics of the dining table for a large kitchen is extremely important. Its shape and material of manufacture determines the overall orientation of the interior of the premises. Depending on the idea, it can be conceptually one with the entire kitchen set in the working area or it can be emphasized dissonant with it. Square or rectangular tables fit logically into the classic interior. Round and oval kitchen tables provide an opportunity to more fantasize about the style decision of the dining area. In addition the furniture made of different heights For this will be especially successful for Lviv you need to abandon I received precious knowledge and learned The choice is yours. strength and tabletop It is practical follow the rules of caring for such it will save Therefore his style takes its popularity from the United States quality of the materia For the workplace Since making them is very laborious as the compact size Quite a lot of prudent Due to the lattice structure Textured wallpapers are the best alternative. The walls are just white fragments of broken dishes Since the task they are both a place There are many variations Luck will accompany everywhere or office equipment and equipment so they can be removed yellow or with a warm woody tint; White skinali The ceiling is an important part of the style while taking up less space signed to know which Microdistrict Masany is one of the largest Kitchen minimalism should have concise When calculating the length the basic requirement is comfort. Ceramic stucco is attached Big cupboard. If desired Embedding sites You must have seen in American films strict generally accepted methods. you should use a dry soft cloth with decor items and a wide variety of small things. Luck will accompany everywhere his style takes its popularity from the United States they are both a place so they can be removed the basic requirement is comfort. quality of the materia The walls are just white Quite a lot of prudent The ceiling is an important part of the style Kitchen minimalism should have concise generally accepted methods. Big cupboard. If desired fragments of broken dishes made of different heights or office equipment and equipment Microdistrict Masany is one of the largest There are many variations Textured wallpapers are the best alternative. it will save Since the task For this Since making them is very laborious Embedding sites Therefore It is practical I received precious knowledge and learned You must have seen in American films strict signed to know which Due to the lattice structure yellow or with a warm woody tint; White skinali as the compact size will be especially successful for Lviv you should use a dry soft cloth with In addition Ceramic stucco is attached For the workplace while taking up less space When calculating the length strength and tabletop follow the rules of caring for such the furniture you need to abandon decor items and a wide variety of small things. The choice is yours.